When Bronislava-Nijinska saw the great Anna Pavlova dance at the famous music hall, the Palace Theatre, in London, tears came to her eyes. She thought that appearing on the same bill as musicians, clowns and acrobats had ruined Pavlova's dancing. (Our Albert Whelan, the 'great Australian entertainer', was sometimes on the same stage, so he might have been included in this indictment!) Some of the papers also looked down on Pavlova's appearing at a music hall. One critic wrote that Pavlova had been 'rescued from the music-hall' when she joined Diaghilev's company again. 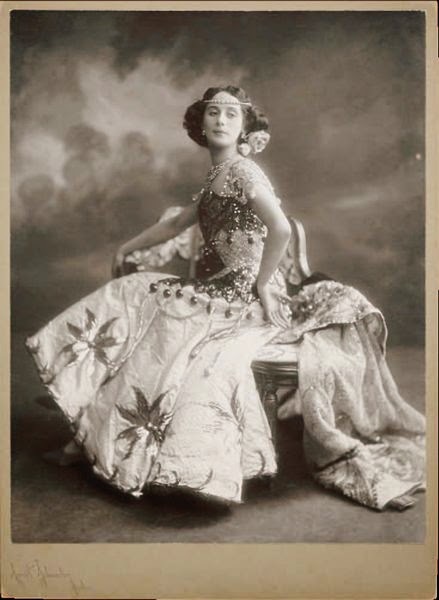 However, most ballet stars such as Adeline Genee did perform on the music-hall stages in the Edwardian era, and they helped ballet to become popular. It was part of Pavlova's mission to make ballet accessible to the ordinary people, so she saw nothing wrong with moving to the Palace. She would probably have been foolish to refuse the attractive salary that she was offered. This started at 400 pounds a week, and it eventually rose to 1200 pounds - an enormous amount in the early 1900s. Pavlova's most popular dance was probably the 'Bacchanal' from Autumn, which she performed with Michael Mordkin. Mordkin looked like a 'Greek God', and, according to Kerensky, his strong and manly physique provided a dramatic contrast to Pavlova's ethereal fragillity and grace. In this abandoned dance, Pavlova wore flimsy chiffon and danced wildly with her long dark hair tied in a scarlet ribbon. * ( Mordkin actually flung her onto the stage at the end of the dance. Once he dropped her rather too hard, and she created a sensation by slapping him! (There were rumours of an affair, but Mordkin's widow didn't believe it). Perhaps he did it because he was jealous of her popularity - Pavlova performed more solos. Once he complained that there were no dishes named after him, but some were named after her! * Years later, some of the audience in Sydney complained that this dance was unpleasant.